Lloyd & Sons Trucking Ltd. was tendered out to supply rock, soil, root wads and geotextile etc. They began work at the site on August 15, 2007 and the majority of the work was completed within 4 working days. The two nose pumps were installed at the site in September 2007. The planting of riparian vegetation was completed the week of October 15, 2007. The work was generally completed according to the plans with one exception as follows. Additional spawning substrate was laid down on the stream bed and a restricted, rock clad secondary cattle ramp was constructed at a point further downstream. This project’s objective included; rehabilitating the channel centre (70m total width) by reducing the rivers width/depth ratio by narrowing and deepening the channel, improving the aquatic habitat substrate through the extensive addition of spawning sized gravel and larger rock boulders; rehabilitating the channels shorelines by establishing a new shoreline that can withstand the force of peak flood flow conditions while providing fish habitat along its edges; re-establishing the riparian zone and its corresponding vegetation/canopy and installing a fence and remote cattle watering nose pumps to keep livestock from damaging this site again. These actions dramatically improved the aquatic and riparian habitats of this site. This “high visibility” project location which is next to a highly used public park area will contribute to the rehabilitation of the Manitou River and will demonstrate the valued benefits of this community stewardship initiative to the public and other local landowners who are apprehensive about participating. The rehabilitation of Manitou River Site M-70 involved the installation of three (3) boulder islands, fifteen (15) root wads, one (1) single wing deflector, ten (10) random boulders, two (2) seasonal nose pumps, four (4) sweepers, one (1) boulder weir and the placement of spawning gravel in various areas on the Manitou River just downstream of the Highway 542 Bridge. A riparian area was created and revegetated along the newly established river bank and a fence was built approx. 30m back from the waters edge to restrict any livestock access. All other disturbed areas were revegetated and stabilized by our partner volunteer group, Lake Manitou Area Association. The work was completed according to the site plans through the cooperation of landowners, dedication of volunteers, consulting expertise of Great Lakes Environmental Services (GLES) and equipment, material, and services of Lloyd & Sons Trucking Ltd. Funds from various sources were used to complete this project. DFO contributed for Site Design. Heavy equipment rental and material costs were paid by for the following; CFWIP, COA, and Eco-Action. COA also contributed for Site Supervision by a certified engineer. This project had 19 volunteers from Manitoulin Streams working on this project at various times. 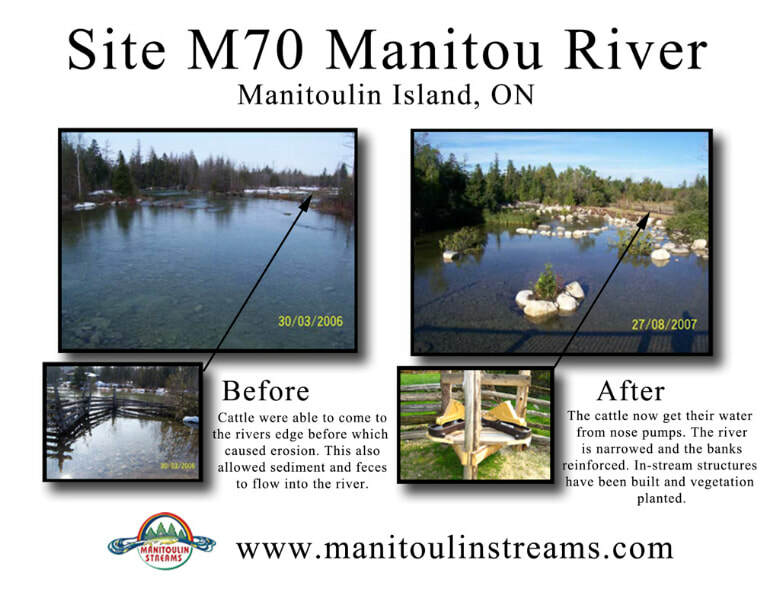 Manitoulin Streams had numerous meetings and email communications to discuss the details about this project including sending out Site Design Request for Proposals (RFP), Tender (RFP) and Site Supervision (RFP) to ensure proper delivery of site design and issuing a winner of the bids. A total of 70 volunteered hours was dedicated by “Manitoulin Streams” committee members attending meetings to discuss planning procedures. An additional 54 volunteer hours were accumulated during numerous meetings with the landowner and the engineer, and planting of (960) trees and shrubs by the Lake Manitou Area Association 10 people x 3 hrs=30hrs. 40m of fencing was installed by 11 Stewardship Rangers and the landowner; 12 people x 4 hours. M-70 site was in need of bank stabilization including improving the channel edges, channel centre (70m), reducing the width/depth ratio by narrowing and deepening the channel, improving substrate, and riparian vegetation/canopy and restriction.